Editor’s Note: The Week In Russia will not appear on December 28. It will resume on January 4. Russian President Vladimir Putin fielded 66 questions at his annual press conference, holding forth for nearly four hours with a record number of journalists accredited for an event he first held in 2001. He didn’t make much news. The biggest news from Russian President Vladimir Putin’s big press conference: He might get married again sometime. Almost everything else Putin said in the three-hour, 44-minute performance on December 20 was a variation on something he has said before , in some cases several times over nearly two decades in power. Even Putin’s warning of the threat of nuclear war and “the death of all civilization” was hardly new: He said in late October that Russians will “go to heaven as martyrs” if there’s a catastrophic nuclear war with the West, while people in the “aggressor” country would “croak” because they wouldn’t have time to repent. Russia’s status on the global stage rests in large part on its nuclear arsenal, and the comments come in the context of U.S. moves to abandon a major Cold War weapons pact, the 1987 Intermediate-Range Nuclear Forces Treaty (INF). But beyond a warning that the West had better take Russia and its warheads seriously, they seem to offer few clues about actual policy going forward. “The start of the press conference – about the importance of a breakthrough – was a quote from his spring address” to parliament, Vedomosti said, while his remarks about an incident in which Russian forces fired on Ukrainian naval vessels off Crimea and arrested their crewmen, who are now jailed in Moscow, were an almost “word-for-word” repeat of what he said at a G20 summit on December 1. On issues like patriotism, Putin’s “self-quoting has continued for many years,” it said. Against that backdrop, Putin’s hint of wedding bells in the future stood out. It’s hard to imagine that the question, and the answer, were not planned in advance. But Putin has made clear that his family life is off-limits to the press — to the point where virtually nothing about his two grown daughters – where they live, what they do for a living — has ever been acknowledged by the Kremlin. And when Putin and his first wife finally confirmed long-standing speculation that their marriage was over, in 2013, they did so in a supposedly spontaneous appearance – a chance encounter with a lone reporter in the Kremlin – that looked awkward but not spontaneous at all. For many Russians — in fact for almost everyone, with the likely exception of one person in particular — some clarity about the political future might be more useful than a hint about his marriage plans. A legal limit of two straight presidential terms means that Putin, who is 66 and has been president or prime minister since 1999, cannot run for reelection in 2024. As a result, the start of his new term on May 7 set off speculation about how much power he wants to retain when that time comes – and how he might go about it. But Putin did not address that question at the press conference, because he was not asked. That’s a possible sign that he is wary of looking like a lame duck and wants Russians, not least those in the government, to focus on his ambitious economic goals rather than jockeying for future position. 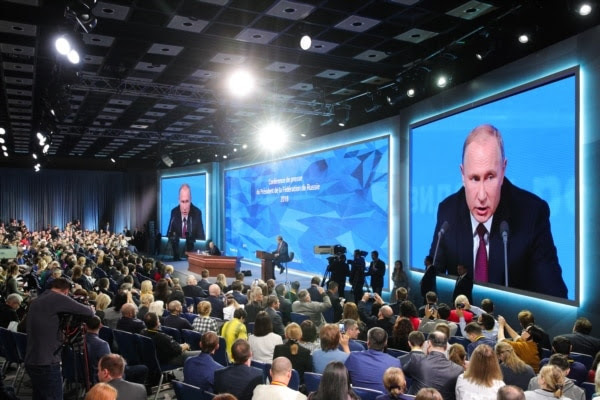 Putin spoke about some of those goals at the press conference, such as a bid to break into the top five economies in terms of size – a tall order for a country listed in 12th place by the International Monetary Fund in 2017. For at least the third time this year, he also called for a “breakthrough” – and acknowledged that he was repeating himself.